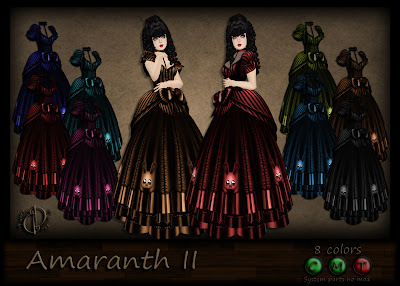 *Dilly Dolls*: Amaranth II is FINALLY here!!!!!!! The official release was last night, and the new release hunt went off without a hitch! The sim was packed, with a max of 50. It seemed everyone was waiting very (im)patiently for this remake of the old favorite! Amaranth has had a major facelift too! Brighter textures, better details, new sculpted bustle and sleeves, multiple top options, a rose collar with a bunny cameo style design on it, and the fact that you can get ALL 8 colors for just L$300. It was a huge hit! Also! I want to formerly introduce our two newest store bloggers, Trinket and Mildread! Welcome my dollies! They will be keeping the blog up-to-date, when my forgetful bootie constantly forgets lol. So welcome them with open arms, and expect to start hearing from them lots in the near future!! !